The Ultra Wall Spot has been designed to be mounted on vertical surfaces. It can be used for wall washing, to provide directional light, and to highlight architectural features and structural elements. It has a fully adjustable head allowing 360 degrees rotation and 0-80 degrees elevation and can then be fixed in place using the inbuilt locking mechanism. 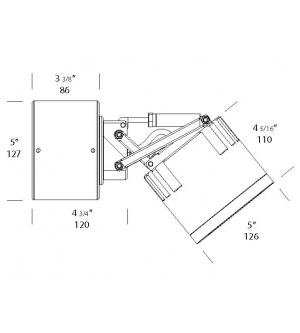 For the USA and Canada the Wall Spot Ultra is supplied with an 8" diameter mounting plate.